Here's another installment of Wiki Top 10 - October. Futile plug: Please help edit the wiki and share your knowledge. Sure, ~250 people pour over the wiki each day for its knowledge of Marquette athletics. Do any of you help out? No! Where's the Marquette charity? Where's the love? I'm throwing down. This should be a layup for one of you out there. Steve Cottingham is blank slate. He's our current AD for the love of pete, and has no wiki page. Steve Cottingham could bite you on the leg, and you wouldn't know who he is without an official wiki page. If you've been bitten by Steve, or if you ARE Steve, click on this link and click "edit this page" and add something. If no one edits his page, I swear, I give up .. until next month. Here's a little something from Haunted Hoops on Friday. This drill groups the players .. it's roughly one on one, if the offensive man either scores or gets his rebound, he continues to play. As a defender, if your guy doesn't score, you rotate in on offense. It was a very cool drill .. I didn't start taping until after Trend's spectacular run of multiple baskets. Round about minute 4 the big boys battle down low. Fun to watch. Rosiak blogs his interview with PG Tyshawn Taylor. Check it out here. The author suggests that the Three Amigos were "struggling on the perimeter" last season. Huh? This was the league's best backcourt last season. Sure, James did not shoot well but the author failed to note that McNeal was the top defender in the league last year, failed to note that Matthews emerged as one of the conference's steadiest players, and didn't realize that despite James' woes from the field he did have an enviable A/TO ratio. The author rightly criticizes this trio for turning the ball over nine times per game last season, but that's less than half the story. In many ways the notion that these guys turned it over nine times per game is overblown. Fact is, Marquette was second in the league in steals per game and fourth overall in turnover margin. The formula worked until McNeal went down with injuries. Further, the spike in turnovers peaked before conference play began -- consider that James' overall A:TO ratio was 1.9 to one, while his league total was an almost-unheard-of 2.4 to one. Lazar and Fitz: The author claims these players are competing for the same minutes and play the same position. That's simply not accurate. Lazar lined up at the PF slot and provided a nice boost to MU's inside presence last year, particularly on the offensive glass. Fitzgerald is a completely different player who plays a complementary position. Fitz is a marksman at 42% from the beyond the arc though apparently "he seems to be either on or off" (as opposed to players who are always on or always off, I guess). Their strangest assertion is the claim that for MU to succeed this year, Dan Fitzgerald's minutes and role need to decline. No, absolutely not. As we pointed out last month, the exact opposite is true: if MU is to be successful this year, Fitzgerald must have a breakout senior campaign. This team does not have enough shooters and Dan Fitzgerald is one of the best returning three-point percentage shooters in the Big East Conference. The BEBR pegs MU for a 13-5 conference record this season. I'd sign for that right now. Last night Marquette hosted their annual Basketball Fish Fry / Haunted Hoops event. The publicity for this event was low, and so was attendance. Easily the smallest crowd to watch a Haunted Hoops since the event began. With a recruit in the house, I don't know why MU doesn't hype this event a bit more. Heck, send out a message to their email list. Scheduling continues to be off kilter. The scrimmage was listed to start at 8pm .. instead, drills continued through around 9pm. Some drills are indeed interesting, though. However, there were three false starts, spanning 45 minutes, for the "children's costume parade" that had kids standing in one spot waiting, moving to another spot, waiting, moving to the floor, waiting. Guys -- these kids have bedtimes, of which, they are far past. Wes really looks great. Shot the ball well, smooth defense. Most improved of the Big 3. DJ played under control .. perhaps too much. Seemed aloof at times. He's still a prime time player. The more I see Acker, the more I like. Quik as in Nestle's Chocolate. Passes and shoots well, a defensive pest. Huge huge addition. Christopherson looked great in drills, Novakian .. but a step slow during scrimmage. If we can pop him free on some plays, he'll be our sharpshooter. I saw Trend hit 11 of 20 from behind the arc in a drill. I do not know what this means. Trend had a great stretch during this 1-on-1 drill, hitting buckets and getting rebounds like crazy. I think he had the longest stretch of keeping the ball than anyone on the team. Cooby had his shoulder wrapped up. Played tough, every minute, though. I hope Tommy Brice picks up chicks at Murphs, because he gets no love (minutes) during public scrimmages. Here's a great thread with player evaluations. With just a few weeks remaining until recruits can sign national letters of intent, Marquette will host PG Tyshawn Taylor this weekend per HighSchoolHoop. According to Jeff Goodman at Fox Sports, Crean visited the St. Anthony's product earlier this week following Big East Media Day. Taylor, a 6'2" PG from one of the nation's elite high school programs, is also considering Virginia Tech, Georgia Tech and Kansas. Taylor emerged as a high-major prospect after a terrific summer, particularly after his all-star performance at RBK U. Check out these video clips of Taylor....he's one tough point guard, wow. Perhaps Taylor will be in town tonight for MU's annual Fish Fry, followed by the practice and scrimmage at the Al McGuire Center. I've officiated Tyshwan Taylor's games for two years now. Over that time I've had his St.Anthony team in some scrimmages, the And1 Classic and several contests at the Hamilton Park Summer League. About a year ago many thought he would be an Atlantic Ten guard. The thing holding him back was lack of a consistent perimeter shot. This Spring and Summer, though, he really stepped it up and is the target of ACC and Big East schools. Taylor has worked on his shot but the thing about him is a great basketball sense. He's an outstanding defender (no surprise there because you play D or don't play for Bob Hurley). In several games I worked Taylor would trigger the break and hit a cutting wing player with a gorgeous pass. Taylor could thread the needle with his passing and he can break down a defense and get inside. One game I had, Taylor (at 6'2") dunked, yes dunked, four times in transition. Overall, Taylor would be a great addition to any high level program. He would be a nice fit at Marquette and I think coach Crean would love having a player of his ability, competitive desire and demeanor on board. When you play for coach Hurley two things are evident : you are superbly drilled in the fundamentals and, of course, you can accept coaching criticism. Simply, Tyshawn Taylor would be a great catch. Your season tickets should arrive today. Take a deep whiff. We've got a new bookmark for you, BigEastCast.com - home of what promises to be a terrific podcast on the nation's best basketball conference. The guys at Big East Cast, Brendon Desrochers from SNY and podcast partner Dante Carnevale, kick things off with a preview of the 2007-2008 Big East. In the first installment, Brendon and Dante look into Big East coaching changes along with loads of other interesting topics --essentially a run through key off-season news from around the league. The pre-season Big East coaches' poll is out. Georgetown and Louisville were picked as co-champs, while MU was picked to finish third overall. I am shocked that the coaches think so little of Notre Dame and Providence. Those are NCAA tourney-caliber teams this year. In terms of individual honors, Georgetown's Roy Hibbert was selected as the Big East pre-season Player of the Year. Dominic James and Jerel McNeal were selected to the 10-man pre-season All-Big East squad. Once again, Wesley Matthews was ignored. Fuel for the fire, I say. *Roy Hibbert, Georgetown (Player of the Year), C, Sr., 7-2, 278, Adelphi, Md. Jeff Adrien, Connecticut, F, Jr., 6-7, 238, Brookline, Mass. Jonathan Wallace, Georgetown, G, Sr. 6-1, 188, Harvest, Ala.
David Padgett, Louisville, C, Sr., 6-11, 245, Reno, Nev.
Terrence Williams, Louisville, F, Jr., 6-6, 210, Seattle, Wash.
Dominic James, Marquette, G, Jr., 5-11, 185, Richmond, Ind. Jerel McNeal, Marquette, G, Jr., 6-3, 200, Chicago, Ill.
Geoff McDermott, Providence, F, Jr., 6-7, 230, New Rochelle, N.Y.
Kentrell Gransberry, USF, C, Sr., 6-9, 270, Baton Rouge, La. Eric Devendorf, Syracuse, G, Jr., 6-4, 180, Bay City, Mich.
*Scottie Reynolds, Villanova, G, So., 6-2, 195, Herndon, Va. Rankings are fun......especially when your team looks good. CHN ranked the top 30 players in the Big East and Dominic James is at the top of the heap. Jerel McNeal checks in at #10, making MU the only program with two of the league's top 10. Strangely, Wesley Matthews gets no respect -- he's listed in the 'next in line' category. I look forward to the recount in March. Here are the CHN rankings of the Big East's best players. Talk about it here on MUScoop. BTW, Big East Media day will begin this morning at 9am CDT in New York City, the greatest city in the world. Tom Crean and the Three Amigos will represent Marquette at the event today. FWIW at last week's Marquette CIRCLES in New York event, Tom Crean indicated that for his preseason coaches' poll he pegged Louisville, Georgetown and Providence as the Big East's top three teams - -in that order. He cited overall experience as the primary reason for selecting these teams to lead the league. Crean did not indicate where he slotted MU. Fans can check out the Big Easts' media day homepage for updates throughout today's event, including video content. That page includes a link to the official Big East preview of Marquette -- find that right here. A year ago today, two Marquette alums, rocky_warrior and spiral filled a void in the community by creating a new forum for MU chatter. The Scoop is going strong, with over 34,000 posts, 823 members, and 2,100 daily visitors, monthly newsletters, hundreds of game-photos, many videos and huge wiki. All in 365 short days. Not all websites make it through a year, especially with strong internet brethren like Scout. I think we've been surprised by its success. On a personal note, I was fortunate to be invited to help moderate Scoop and write for Cracked Sidewalks, and the partnership between the two sites has been outstanding, with a tremendous amount of shared traffic. Thank you MUScoop, and thank you CrackedSidewalkers! 2009 SF Jamil Wilson has 'narrowed' his list to the so-called Great Eight -- which includes MU along with many of college basketball's elite programs. Looks like Jamil is a terrific volleyball player too. MU commit Nick Williams' squad improved dramatically overnight when one of the best players in the class of 2009 transferred to LeFlore. 6'10" center DeMarcus Cousins will lace'em up with Williams this winter. A new blog fave, Storming The Floor, is going through their own top 25 and ranks MU #19 in the pre-season -- and a 3rd place finish in the Big East along with a Sweet 16 bid. Check it out here. Similarly, the Big East Basketball Report is counting down our league's best -- and is up to #4 which could be reported later today. Not sure where MU will land, but its worth watching. Pitt came in at #5, followed by UConn at #6. Brendon Desrochers of SNY looks at Rick Pitino's whining about the conference schedule, and breaks down each team's slate. As for MU, he ranks the Golden Eagles' non-conference schedule as the 2nd easiest in the league and calls their Big East slate the 2nd toughest. Slamming MU's out of conference slate is fine -- but it is non-sensical that Brendon then rates Pittsburgh's non-conference slate as the 9th toughest in the league even though Pitt plays two teams that MU is likely to play in Maui (not to mention that Wisconsin is better than Washington, Duquesne and SLU - the other opponents listed on his his rundown of the Panthers schedule). More updates as they pop on the Web. Recruiting for the freshman class of 2008 could not be more disappointing of late. After the fast start more than a year ago -- an early commitment from the talented Nick Williams -- MU has gone o-fer its top targets. The promise of landing a breakthrough, national recruiting class has quickly given way to doubt, frustration, and resignation about the appeal and status of the program. The status quo remains. MU will continue to be a successful program built on the backs of the unheralded, the under-recruited, the ignored, the occasional recruiting coup, and the overachiever. Not long ago a class of Frank Ben-Eze, Iman Shumpert, Jared Swopshire (or similar) and Nick Williams seemed plausible. After all, Crean was selling a starting center opportunity (but lost Ben-Eze), a likely starting PG slot (but lost Shumpert), and perhaps a starting SF slot (but lost Swopshire, among others). As if on cue, when this class' bellwether target committed to Georgia Tech last week MU accepted a verbal from a player who previously pledged to a mediocre program in the Sun Belt Conference. Keep in mind, this is a player who has yet to visit MU, which is exceptionally odd since Crean has cooled on some players during official visits (as a commenter below pointed out). Obviously, Joseph Fulce fits the profile of this program. There is clearly a recruiting ceiling at Marquette; it has been some two decades since the program lured a legitimate national top-25 player to campus. 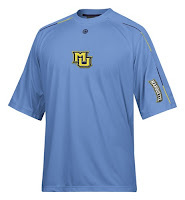 Sadly, Marquette is not a destination program for the nation's elite prospects. Meanwhile, MU fans watch as Georgetown, Syracuse, and Louisville reload with A-list talent as Crean scrambles for options C, D, E and F.
Some fans will take solace in noting that MU is getting closer on some of these big-time players, but college basketball is not darts. Close means nothing, recruiting is pass/fail. And while MU seems to offer more than a dozen kids in any given class and chases elite prospects all over the place, the payoff remains negligible. The good news for MU fans is that Tom Crean has figured out how to build and sustain a strong program with these types of players. Crean is a master at finding diamonds in the rough, and has proven himself to be an outstanding evaluator and developer of backcourt talent. These traits will continue to serve MU well as the program matures under his stewardship. And frankly, despite these tough recruiting losses of late the program is still loaded with talent -- although its highest-ceiling talent are now upper classmen. No offense, but you don't build a top 25 program by playing guys like Hazel, Burke or Cubillan for 30 minutes a night. It is time for a recruiting breakthrough or five. For the 2008 class, let's circle the wagons and hope for the best. Inking Tyshawn Taylor and Chris Otule would be a terrific recovery for MU -- and that is still possible. Still, the 2009 group just became the most important incoming freshman class since the impressive haul headed by the Three Amigos. Erik Williams seems like a good start, though you have to wonder what the recent overloading at the SF slot means for the uber-talented Jamil Wilson of Racine. Time for a rebound on the recruiting trail. Maybe a breakthrough? In an interesting article in this morning's Boston Globe, it's reported that Marquette is fidgeting with the team's lungs. Inside an altitude chamber that simulates conditions at 9,000 feet above sea level, Marquette University guards Wesley Matthews and Jerel McNeal start pedaling stationary bikes. Realizing the challenge ahead, they look less than thrilled. Within minutes, Matthews and McNeal experience shortness of breath. Heart rates rise quickly. In five minutes, Matthews and McNeal have stressed their bodies far beyond what they could do on a bike outside the chamber. After purchasing a customized altitude unit this summer for $41,700, Marquette became the first college basketball team in the country to integrate the hypoxic chamber into its training regimen, following the lead of professional sports franchises such as the Green Bay Packers, Detroit Pistons, Miami Heat, and Phoenix Suns. In case you missed the internet forum frenzy, Iman Shumpert did not give the nod to Coach Crean, and is instead going to Georgia Tech. My wife suggested, "Well, there's direct flight from Chicago to Atlanta." Guess that's how his family will watch him play. Maybe they didn't want to pay tolls on I-94. Joseph Fulce, a 2006 Plano Senior graduate and starter on the Class 5A State Championship Wildcats squad, has verbally committed to play basketball at Marquette. He's a 3 star small forward from Plano Texas. We'll update this as we figure out more. Welcome aboard, Joseph. We're just hours away from learning Iman Shumpert's college choice. The MU message boards are rather tense, with good reason -- it has been years since a player of this acclaim and caliber actually committed to Marquette. Iman Shumpert is a bellwether recruit for the program. Can MU break through and ink a nationally-ranked player of this magnitude? Simply put, Shumpert is the the kind of player who would signal to other big time prospects that it is OK to sign with MU. This one matters nationally. If MU swings and misses here, it won't be for lack of effort. Crean poured it on in the pursuit of Shumpert, consider: the clever midnight visit as the open recruiting period began, securing Shumpert's final visit, Marquette Madness, and Dwyane Wade. Well done, TC. Of course, if MU can't land a kid at a need position after that kind of royal treatment, well........it is likely more of the same for the program on the recruiting trail, and a kick in the 'nads for Crean. Look, MU will be just fine either way; Crean has proven that for the last decade. He has an eye for talent, particularly in the backcourt and he's proven that 'recruiting rankings' are not the only measure of future success. However, Shumpert presents a undeniable opportunity to ratchet this program up several notches in the eyes of big time recruits for years to come. In a sense, Shumpert's decision is all about credibility. Does MU have it or not with players of this caliber? The Bullseye Brothers and Chicago Hoops both report that River Forest/Oak Park guard Iman Shumpert will announce his college choice this afternoon on "Chicago Tribune Live". The show runs from 5:30-6:30 PM CDT on Comcast SportsNet. Shumpert will choose between North Carolina, Georgia Tech and Marquette University. Follow this link to an exceptionally well-written and researched post by Henry Sugar on MUScoop. Things are trending ever-upward at MU. Mookie Jones holds a press conference this afternoon in Peekskill to announce his college choice. He's been a Syracuse lean for sometime - expect him to verbal to the 'Cuse per Zagoria. Illinois HS Basketball spoke with Iman Shumpert after his MU visit. Expect a decision by Thursday (scroll down to find their Shumpert entry). Incidentally, one of the editors of that site is offering his perspectives on several current and potential recruits in this thread at MUScoop. In the search for a center category, it looks like MU might host 7-footer Garrett Stutz n October 27 per Van Coleman. Let's wait to see if that visit is verified elsewhere though. 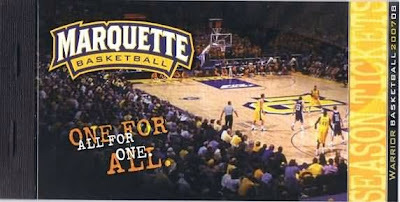 According to Todd Rosiak, Erik Williams has committed to Marquette for 2009. It didn't take long for 'Marquette Madness' to make an impression on at least one recruit. Erik Williams, a 6-foot-7, 190-pound junior forward from Cypress Springs (Tex.) High School gave MU an oral commitment on Sunday afternoon, becoming the first player from the 2009 class to do so for the Golden Eagles. Williams said he'd also received scholarship offers from Alabama, Texas A&M and Baylor, all of whom he'd also visited unofficially, but that he was sold on MU and convinced that was where he'd fare best. Williams, who projected himself as a wing for the Golden Eagles, is the second player in as many years to commit to MU either prior to or shortly into his junior year. Nick Williams, a guard from Mobile, Ala., committed to MU last summer as he headed into his junior year. The All-Star and NBA Champion made a surprise appearance at Marquette Madness tonight, much to the delight of the fan base ....... and perhaps to the amazement of key recruiting targets Iman Shumpert, Jared Swopshire and Nick Willlams. Nice work, TC and DWade. Details here from Todd Rosiak. 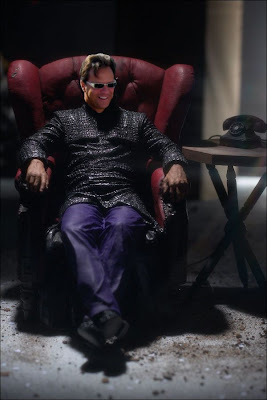 With Marquette Madness just hours away and the recruiting campaign reaching a crescendo, Cracked Sidewalks was given unprecedented access to Tom Crean's persuasion playbook earlier this week. Chapter one focused on the sublime Iman Shumpert. Here's what we know. In his initial on-campus meeting with Shumpert yesterday, TC mimicked the remarkable Morpheus by challenging the young prodigy to consider where his ultimate potential as a person and player would be realized. "Iman, this is your last chance. After this, there is no turning back. You take the blue pill - the story ends, you wake up in your bed and believe whatever you want to believe. You take the red pill - you stay in Wonderland and I show you how deep the rabbit-hole goes." Here's an MU related PSA........The athletic department set up a new site where all of the MU schedules are available for download into Outlook. Heck, they even have step by step instructions to support the effort. Click here to download the MU schedule into Outlook. In a major blow to Marquette's recruiting efforts, highly-coveted 6'10" center Frank Ben-Eze today committed to Harvard over MU and Virginia Tech. IWB had the news first over at Marquette Hoops. Congratulations and good luck to Frank. Harvard, wow. Anyway you cut it this is a huge hit to the 2008 recruiting class. Amazingly, Crean has a starting center spot available for the taking -- yet still can't land the type of immediate impact, high-ceiling center you'd expect from a top 25 program. Sadly, the last center to sign with MU was Ousmane Barro -- a kid who did not play high school basketball in the U.S. There is some reason for optimism. Crean is recruiting a host of other centers (O'Tule, Stutz and Sutton) but at least two of these appear to be projects. Also, it is worth noting that in the past, recruiting misses at the center position have not dealt the kind of blow to the program you might have expected (think Bryce Webster). As long as the backcourt remains strong, Crean's system can overcome the absence of a consistently productive center - - but it should not have to be that way. Imagine what this program could be with a formidable front line anchored by a true center. Imagine is all we can do for now. What do you think? Talk about it here at MUScoop. Brendon Desrochers of SNY in New York continues his in-depth preview of the 2007-2008 Big East season with a look at Marquette. Brendon slots MU in as the 4th best team in the league and zeroes in on the familiar themes -- MU has terrific guards who can't shoot, and bigs who can't play. Methinks he's selling MU short for the most part -- you'd think Desrochers expects little or no year to year improvement from Crean's bunch despite the heavy dose of returning starters and role players, plus an influx of Big East-ready talent. His notion that MU was 'fringe NCAA team last season' is laughable, plain and simple. And the loss to MSU -- however ugly -- should not the ultimate barometer in evaluating MU last year considering the game was played without the Golden Eagles' best player. Desrochers ignores Maurice Acker. Acker is the one backcourt player that should allow MU to run new, different looks this season on offense which should result in higher shooting percentages for the Three Amigos, not to mention adding a valuable defender to a team that should turn the opposition over even more regularly than last year. Considering how Desrochers considers McNeal's injury bug to be such an issue, he should have detailed the Acker possibilities. Heck, he also ignored Christopherson -- by all accounts a fine shooter, though there's doubt about how much he will be able to contribute as a freshman. Yes, Fitz needs more shots! I am glad somebody else agrees. Desrochers does not have a feel for Hayward's game, nor does he account for the Lazar's slow start based on the Clearinghouse concerns. In fact, Desrochers misrepresents Hayward's game by pointing out that the forward made just 20% of his three points shots -- as if to equate his game with that of the the Three Amigos. Of course, Hayward attempted the fewest three pointers of any key player on the roster last year and was a surprisingly effective inside presence for MU in conference play (where he started 13 games). Ultimately this is nitpicking......MU does struggle from the field and has a questionable inside presence. Still, with a veteran team returning every viable contributor from a group that won 10 Big East games last season, I'd expect MU to finish better than 4th overall. What should we expect of a team that started the season so swimmingly — reaching the top ten in December — and ending the winter as a fringe NCAA Tournament team, easily dispatched by the superior Spartans? With most of the key players on Marquette juniors and seniors, I'd expect a more even level of play across the season. The Eagles' defense will continue to turn over opponents and try to create easy baskets off those forced errors, but the combination of a backcourt that is not a threat from the outside and a frontcourt without an offensive weapon probably means Marquette's ceiling is lower than it might be otherwise. According to Todd Rosiak, Trevor Mbakwe has been cleared to play. Freshman forward Trevor Mbakwe was given the all-clear by the NCAA Clearinghouse this afternoon, just three days before the official open of practice. "Thrilled for the program, but really excited for him because it's been wearing on him," said coach Tom Crean. "He's done, in my opinion and I think in everyone else's, an incredible job of staying focused, going through the daily process of being a college student and not knowing what was next when it comes to something that he loves." The 6-foot-7, 240-pound Mbakwe is expected to step in and play a large role for MU immediately. His academic record had been undergoing scrutiny and he had been barred from any organized team activities while the process was underway, much like Lazar Hayward a season ago. CNNSI says MU has the third-best backcourt in the nation. Click here to see the rankings. What do you think about MU's slot in the list? Talk about it here on MUScoop. Coach Rab is back with the 14th installment of In Rab's Words. The Fayetteville Observer notes that Roy Williams continues to recruit over Iman Shumpert down on Tobacco Road. No surprise there. Rivals.com catches up with Dominic James. "James received an invitation to the NBA's Orlando Pre-Draft Camp, but the reviews of his play there were Britney-at-the-VMAs bad." Ouch. It looks like MU is no longer interested in Josh Crittle. Here is a blurb from the Bullseye Brothers. Frank Ben-Eze and Dominique Rutledge, come on down. OK, t-minus five days until Marquette Madness.......check out the way cool video from the GoMarquette site, which is embedded below. Muy bien. How does Dominic James not cut his head on the rim? Insane. October is upon us, and that means midnight madness is just days away. Let that swirl around in your head for a minute. The long dry summer is over. We can put away our shorts and bring out our MU sweatshirts. Marquette Basketball season is within sniffing distance. And, oh, yeah. Marquette's gonna be good this year. Depending on the pre-season ranking you look at, we're anywhere between the #10th and #15th best team going into 2007-08. With all of our starters back this year, Marquette will be running for the Big East Title. Video from August open scrimmage - First look at this years team! UWM vs. MU something big? New TV Package - 13 national games, the rest on local TV! 3. What's coming up in October? Oct.13th Midnight Madness - 7-9pm - Al McGuire Center - Recruits Shumpert & Swopshire in the house. A wiki, of course, depends on volunteers. We need your help. Spend a few minutes and update your favorite player's page. Or, maybe you remember 1995 like it was yesterday, and can improve the season recap for that year. If you're up for contributing an hour, 5 minutes, or even 30 seconds, head on in and add to your hearts content! We at MUScoop.com look forward to seeing you in the boards as we all eagerly look forward to the next season. Please remember that this site is dedicated to being "by the fans, for the fans". If you have any suggestions at all to improve YOUR site please post it to the suggestions board. Until next month ..
With nine days left until Midnight Madness, the most anticipated season in recent Marquette basketball history is nearly upon us. The Golden Eagles return every viable contributor from last season and welcome an influx of exciting talent to the roster. Coming off of back-to-back NCAA appearances that rightly established the program as a viable Big East contender - - the 2007-2008 squad should once again be among the conference's elite, if not the nation's. So while we wait for real games, reports from practice, and maybe a verbal commitment or two . . . . . here are a few concerns and predictions for the upcoming season. Run, Run Away: If MU's performances in Vancouver are any indication, this team will run like hell. Dwight Burke barely broke a sweat in the games up north, and Barro was Barro.....which is to mean he's the only player taller than 6'8 who is allowed to touch, much less shoot the ball. So it appears that MU will run four-guard sets routinely this year......and will pressure the ball with increasing frequency as the season wears on. Goodness. Key to the season: Dan Fitzgerald. Fitz was underutilized last season despite hitting on 43% of his three-pointers. The kid needs more shots, but to do that he has to be on the floor. If Fitz can improve his defense and stay out of early foul trouble, look for him to have a surprising senior season and stretch defenses. Crean has a habit of enabling seniors to have breakthrough final seasons on campus. Fitz will be next. Most likely to struggle: David Cubillan. With Maurice Acker in the mix, look for Cubillan to struggle with his role in a more crowded backcourt. Crean needs PGs who can run a north-south offense, even in the halfcourt. David is an east-west player when he's at the helm, unable to beat defenders off the dribble. How will he adjust? Biggest concern: Three point shooting. If MU rolls out a four-guard lineup with any regularity, those fellas better hit some shots from deep. Of course, we know that the Three Amigos have not exactly proven to be great shooters.......so it comes back to Fitz, Cubillan, Hayward (I am presuming that he'll find his stroke this season) and maybe Christopherson. Now, if Cubillan struggles to adapt to his new role as predicted - - well, Dan Fitzgerald must lead the pack. Most pleasant surprise: Dan Fitzgerald. see above. Breath of fresh air: Maurice Acker. MU will now have three guards on the roster who can break down a defense. With only James and McNeal capable of putting pressure on a defense last season, Crean's rotation was somewhat limited despite the obvious backcourt depth. With Acker, MU will be able to move McNeal and James off the ball more than ever -- making the Golden Eagles' attack all the more potent. Most frustrating player: Dwight Burke. He's a big body that'll have a moment or two this season but his poor footwork and lack of an offensive game betray his big body. Burke is what he is and will be as a collegian -- a below average post player on an ill-conceived baseline rotation. Please Redshirt: Scott Christopherson. The kid is a gamer so let's not waste a year of his talent on mop-up duty in this loaded MU backcourt. Wasting a year on the active roster -- that's exactly what MU did when Barro was a freshman. Can you imagine Barro as a redshirt junior this year? Let's give Christopherson the gift of time. Please Don't Redshirt: Patrick Hazel. MU could use the extra minutes on the baseline once in a while and he doesn't project to be a starter, much less a star. Can Hazel give MU some high-energy minutes and spot production on the baseline? Let's find out. Player I Can't Wait to see: Lazar Hayward. Hayward's dramatic and consistent progression last season was a pleasure to witness. With one full year in Crean's program, expect to see an even more diversified, assertive forward this season. Still, it is troubling to realize that Hayward will line up at the PF slot this year.....how is that for proof that this roster's frontcourt is questionable? Finally, he'll help: Trend Blackledge. Look, MU doesn't need this kid to score - - but a few minutes of high energy on defense and perhaps some garbage baskets will work wonders for this veteran team. Plus, in the last few seasons MU has been routinely torched by SFs (Tucker, Nichols, Green, on and on and on), and Blackledge should help there (much to Wesley Matthews' benefit). Best Player on the Court: Wesley Matthews. Give me the solid, consistent contributor who improves every year. Matthews is that guy for MU. He'll be a breakthrough performer nationally in 2007-2008, and make a living playing this game soon enough. Role Player MU needs most: Trevor Mbakwe. If you need any proof of how much Crean needs Mbakwe to play this season, please review Dwight Burke's career numbers. If Mbakwe is cleared by the NCAA, the program will strengthened immediately and for years to come. Rarely have so many coaching greats flocked to a New England high school gym for such a small private showcase. "I've never been at anything like this," said Crean, one of eight coaches who already have offered scholarships to Murphy, a 6-foot-9-inch, 220-pound junior. How good can Murphy be? "In my view, Patrick Ewing is the most accomplished player ever to come out of New England, but at the end of the day, Erik Murphy will be in the top five," said T.J. Gassnola, who operates the New England Playaz. Murphy is an interesting target for MU in the class of 2009. MU clearly needs a talent upgrade on the front line, and TC is aiming high with this kid -- considering UF, UNC and most college basketball royalty are after him. Can MU hang with this competition? I'd like to think, 'yes'. However, perhaps Murphy is the kind of kid more likely to consider MU seriously if Crean can deliver a breakthrough 2008 class. Know what? It could happen. For the first time in several recruiting cycles, MU could be on the verge of a major breakthrough nationally, ratcheting the program up a notch in the eyes of high school coaches and emerging talent all around the country. A 2008 freshman class that includes Shumpert, Ben-Eze and Williams (or similarly rated talent) would make MU a much more viable option for more of the nation's elite down the line-- kids like Murphy. All the more reason why the next 45 days of the off-season will be among the most interesting and significant in recent memory. Per Zagoria's blog -- lots of details here. Congrats and good luck, Lance. Despite losing Goulbourne, MU seems bound and determined to sign a combo forward this year. Crean is still actively recruiting a slew of talent at the SF positions including Dominique Rutledge (visiting MU this week), Mookie Jones (on campus last week), Renaldo Woolridge (on campus last week) and Jared Swopshire (on campus later this month). I am a sucker for Al McGuire retrospectives, and Chris Maynard at Hoops4theSoul filed a terrific post yesterday (which happened to be Jerome Whitehead's 51st birthday). Thanks for the nostalgic rush, Chris.